Yes, I’m representing the @Ireland account operated by worldirish.com, and with over 15,000 followers and dropping fast, it’s the largest audience I’ve ever had to express my opinions, and I am probably doing fine. The most significant factor is that I’ve hardly put my phone down since Monday. I am not looking forward to the attention withdrawal symptoms. I’m the first Irish person to take hold of the account who is based in Asia, but I’m also the first person to manage it from a location really far away, and really foreign. I recall a guy being in Germany early into the project, and there was another fella based in New York, but for all the Irish on a similar time zone to Korea, such as Australia, there have been none. You might think this significant. I know that because I am far from Ireland I can’t really get involved with many of the current issues taking hold of the country, but that’s not what this week is all about. It’s about me being Irish, having left Ireland, and moved on to a country very far away from home to make a living and to start a family. I, as well as many, many more Irish people have done the same. Many of us have thrived, and of course many have not. But we are all Irish. So far things have gone well I suppose. I’ve managed not to get trolled too much, while there are some people who just seem to want to take exception to another person’s opinion on a twitter account designed to have a variety of perspectives. Frankly, I don’t really care what they say, but it would wrong to say I wasn’t affected by it. Because, well, I thought everyone thought I was fantastic. Tuesday had to have been the most intense day so far. I raised an issue I had with a newspaper article which dove into the subject of emigration with references to the great famine. Now I understand about giving an argument context, but this is a regular columnist in a paper of record writing about a well-known and documented event in our history. Context is already ingrained in the society of the vast majority of people who read it. Bringing up the famine is further scaremongering and poorly reflects on the reality faced by people today. One other thing that got to me was that there is so much talk of emigration from the home perspective, but none from the perspective of those emigrating, or those who have to immigrate into another country. I was heartened by a lot of support shared with the post being starred and retweeted. I noticed that many of those who were doing this were actual Irish people who did not live in Ireland any longer. Emigration is still a topic which many draw strong conclusions on, but regardless of the figures and statistics we will always have to remember that it is always a personal endeavour and those who go through the process do so for their own reasons. Aside from that things have been fine. A few pictures of my lunch and dinner, as well as being distracted to the point of getting absolutely no work done. Last night I landed myself in the trap of doing a “you know you’re Irish when” thing, but tried to recoup my losses today by explaining my real feelings on Irishness and how individuality is creating a more diverse and open society. That being said, I have been tempted to mention abortion but I’ve veered away for fear of entering a discussion I am out of my depth in. Overall though this experience has been incredibly positive. I’ve felt engaged with Irish people of such a wide variety of backgrounds, and it is something I’ve never encountered before. People are friendly, curious, and I believe pleased to have further proof of the strength of the Irish diaspora. I’ve shared some bits and pieces about Korea and I hope that over the final few days I can share some more. So, for another few days I’ll continue staring at my phone itching for more hellos and retweets, and maybe a wee skirmish or two over some topical issue. Tomorrow I think we, as in myself, Herself, and +1, are heading off to some tombs. We’ll sit in the sun, read, play, and I’ll undoubtedly be live tweeting the entire experience. Sounds enthralling. Did I mention there could be some class of a music festival on Saturday? 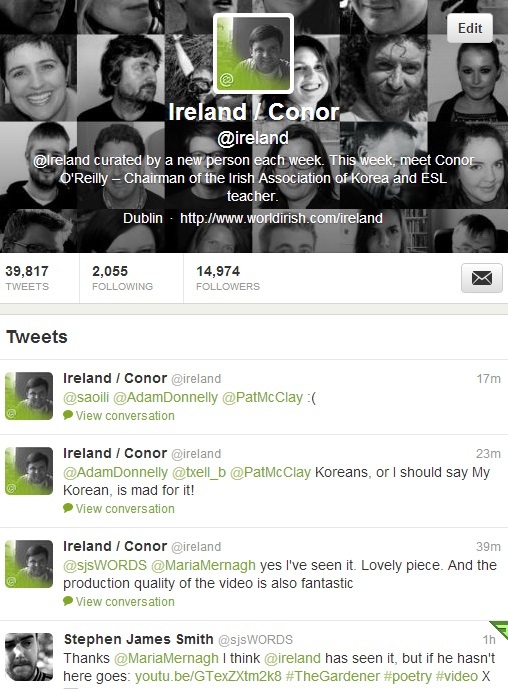 This entry was tagged 2013, Conor O'Reilly, curator, debate, difference, different time zones, emigrant, emigration, from, immigrant, immigration, Ireland, Irish, irishman, korea, letter, life in korea, Main Menu, may, national account, opinion, people, perspective, representing, tweeting, twitter, worldirish.com. Bookmark the permalink. Jaysus Conor! You. An opinion. Never!